Episode 14 – This episode is better than the Bills. .. But we aint no Cleveland Browns. Football is back baby!!! We begin our weekly roundup of all things NFL related from week 1 of the season – Players of the week (see episode 12’s title for a clue on that one…) – Play’s of the week, hereby now christened as the Tyreek Hill round-up and our disappointments of week 1. 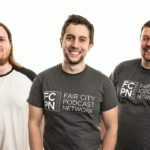 Gav and Andrew do their Fantasy Football analysis, giving you insights on who to be targetting on the waiver wire or making trades for to help you win.